I’ve given my self the rest of March to release my Minesweeper. In my previous post I wrote down the six steps I plan to follow when developing each of the games. The first step was to implement the classic version of the game. I started the project Friday and quickly got the basics up and running. The biggest hassle was to understand how Unity works. For the first classic version I didn’t use any sprites, but instead each tile is just a purple square and flags are pink. 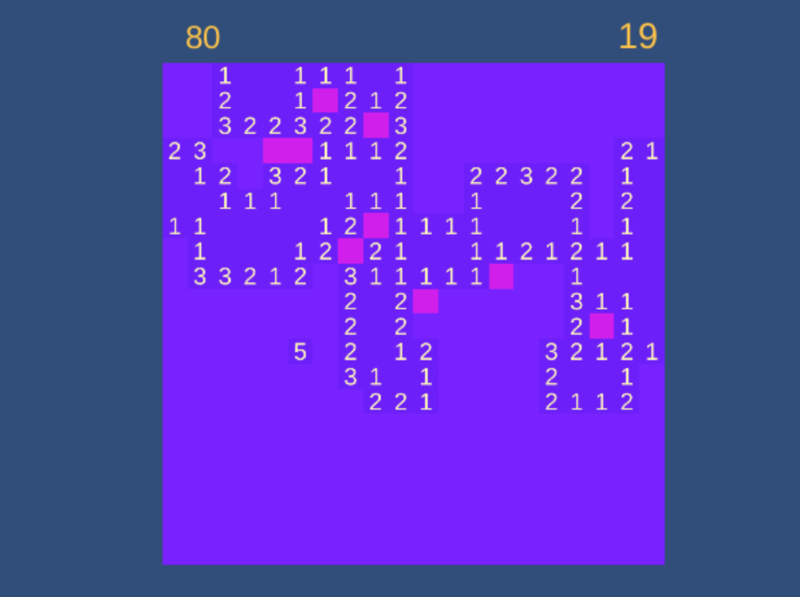 When a bomb is hit the tile disappears so the blue background is shown. Step two on my list is the first attempt at polishing the game. This ending the game when a bomb is hit, and then starting a new game at the next mouse click. I also spend some time balancing the colors for revealed and unrevealed tiles. Both are a slightly different purple with revealed tiles being the darker. I’m still in the first polishing phase. My next focus is to create a game menu from which you can choose between three different board sizes. It should of cause also be possible to go back to the main menu from within the game. When a game ends it should then be possible to decide between starting a new game with the same board size by just left-clicking on the mouse, or to go back to the main menu and choose a new board size to play. I also want to add a simple high score list. But I think this will only be part of the final version. I’m making a WebGL build of the game while I develop it. This is for easier testing and so that I can easily share my progress. However, my main focus for the final game is Ubuntu/Mac/Win. You can try out the newest version here.